You have to admire the confidence of a programme that can set nearly a whole episode of itself in a rubbish-looking hotel. Strictly speaking, it was just a corner of some alien planet or other made to look like a rubbish hotel, but the effect's the same. Which was, namely, to make the audience think we were all in for another episode of Doctor Who done on the cheap, like the slightly disappointing Night Terrors episode the other week. Amy and Rory had much more to do rather than escape from something tedious and time-filling they'd become trapped in while the Doctor got the main action. The obligatory Real Life Thing or Object Designed to Creep Out the Children was there - this week, a ventriloquist's dummy, which, this week, worked. It was creepy. And - brace yourself long-term fans - the creature was referred to as a minotaur, and said to be a distant relative of the Nimon (referencing notorious Tom Baker 1979 serial The Horns of Nimon) (but to tv-ooh, the creature looked more like the Destroyer creature from the 1989 serial Battlefield, as it happens). And, perhap most importantly, the Doctor himself was the most Doctor-ish he's been for a while - funny, quirky, thinking, vulnerable yet powerful, and in control. Throw in David Walliams doing a prosthetic-ed up turn as a cowardly rat-like alien - almost like a character from Little Britain if it were to do a spacey-spin off (it'll happen one day, when there are no more ideas left) - plus some good character-led writing from the pen of Being Human creator Toby Whithouse, who, if Steven Moffatt ever moves on from the show, could be the perfect replacement. But Doctor Who's at its best when it's focusing on the main characters and their relationships. So the unexpectedness of the last five minutes, as the Doctor returned Amy and Rory home, was a nice surprise. To see a bit of outdoors, and the TARDIS back on a normal street, was a contrast after the gloom of the hotel interior - and, with it all feeling a bit like the Russell T Davies-era for some reason, it was a reminder of why many of us love the show so much. Amy and Rory will be back, of course - they have to be, because it's the finale in two weeks. But before that, it's Cybermen and James Corden - and tv-ooh is definitely more excited about one rather than the other. I thought tonight's episode was spiffing. Had everything - fear, laughter and emotion. 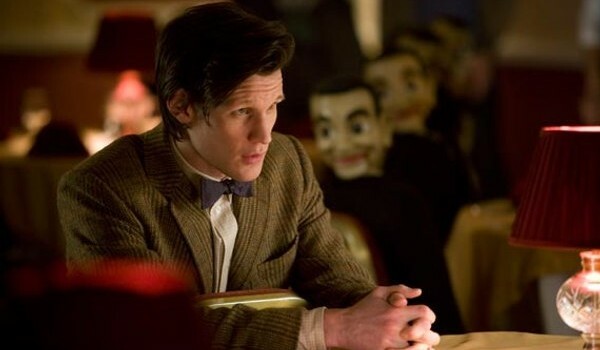 And I trust you're looking forward to the cybermen the most? Nextg week's episode is the one I've been least looking forward to becase I cannot stand James Cordon.